A pioneer in the domain, Safa Honey Company established in 2007, is a well-renowned name in India as well as the international market, which provides distinguished varieties of honey for the healthcare, food or wellness and beauty care industries. A good experience of the honey consumer market, the desire to work with ethics, an unparalleled level of sincerity, and above all, the Almighty’s blessings have been the strong pillars of our flourishing business. Having invested more than a decade's searching, we at Safa have been nurturing our business associations with some of the most distinct cooperatives of the honey collectors from forests, the direct producers in the Himalayan regions, and with many of the traditional beekeepers and the honey, producers spread across the country. We source and process the best of honey from these associates, also offering the best of varieties at a great value to the health conscious consumers. Our organization continues to surpass the standards that are set by the leading world-class companies. We firmly believe in long-term, profitable, enjoyable, and sustainable relationships with all the key stakeholders, including the customers, employees, suppliers, and the members of local communities as well. Our mission remains to make our name and products recognizable among the prominent names in the world. Quality, purity, and safety of the products should be of utmost priority while considering a supplier partner in the food, drug, or cosmetics industries. We have invested more than a decade's searching in developing the business relationships with the most distinguished honey harvesters of the country. Sourcing and processing the very best of honey from these beekeepers, we offer both variety and value to the health conscious consumers. Retaining competitive rates, we ensure that the quality of our products or services is never ever compromised. We prioritize the quality, purity, and safety of our product range to guarantee the compliance with the international trade of honey from its reception to its expedition. An exotic product range, expertise in beekeeping and honey harvesting and a customer-centric approach have enabled us to gain an enviable position for our organization. 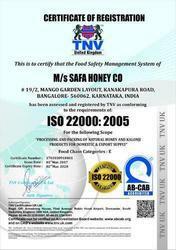 Quality assured honey is the purest in the market, and is as per the preferences and requirements of the clients. Available in different packaging options, our range is quite popular and has become the preferred choice of our huge clientele spread across the globe.